Home › PPL Center Arena › Nittany Lions To Dethrone NCAA King At PPL Center? Lead hockey analyst der Eishockeyzuschauer continues his review of the four NCAA hockey teams set to face off at the PPL Center starting tomorrow. Here are the links for Ohio State, Princeton, and Denver. 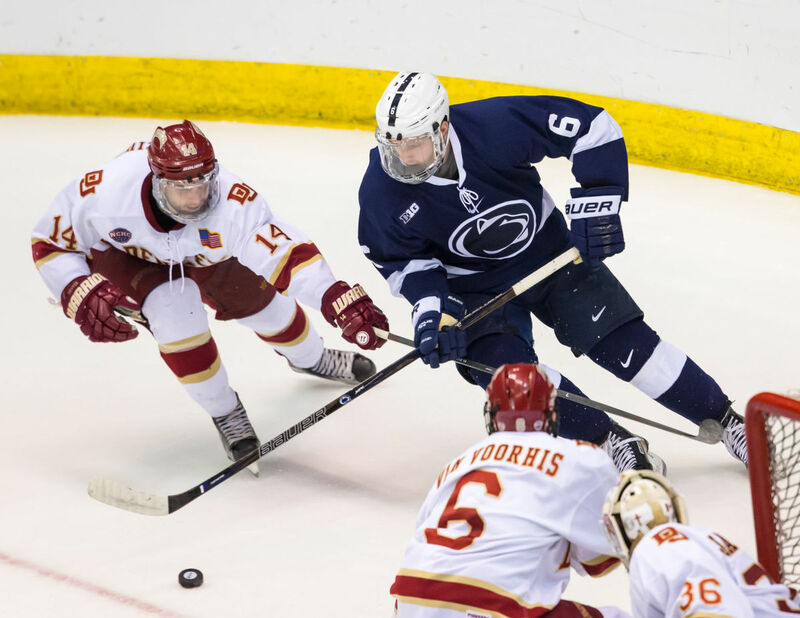 What’s more, the Denver University vs Penn State tilt is also a rematch of the Midwest Regional Final from last season’s 2017 NCAA Men’s Ice Hockey Tournament, a contest that was staged at the US Bank Arena in Cincinnati, Ohio. On that occasion, three unanswered goals by the Pioneers in the second period broke open what had been a game that had been played on even terms for the first twenty-five minutes or so. Surely, then, the Nittany Lions will be looking to even the score when the puck is dropped in the city that made Billy Joel famous. Penn State (18-14-5), to be succinct, are a team that lives and dies by its ability to score goals. The good news is that there is only one other school in all the land that averages more than the 3.70 goals scored per game that PSU have this season. But the bad news is that head coach Guy Gadowsky’s charges are also currently ranked # 42 out of sixty Division I teams in the country having surrendered an average of 3.11 goals per game. Penn State ice three well-balanced scoring lines as well as an effective checking line that can also chip in with a fair amount of goals, too. The points leader this season is Andrew Sturtz (36 ga, 14 go, 40 pts), who also topped the Nittany Lions with 22 goals last term; the 23-year-old right wing from Buffalo, New York, was named Honorable Mention All-Big Ten this season. Centering the all-junior line is Chase Berger (37 ga, 11 go, 27 pts), the 23-year-old from St. Louis. Doing dirty work in the corners is Alec Marsh (34 ga, 2 go, 9 pts), the 22-year-old from Bridgewater, New Jersey, who tips the scales at two hundred pounds. Evan Barratt (31 ga, 11 go, 18 pts), the 19-year-old freshman center from Bristol whom the Chicago Black Hawks selected in the third round of the 2017 NHL Draft, is one of three regulars on this Penn State squad who hail from the Philadelphia area. Alex Limoges (36 ga, 7 go, 21 pts), a 20-year-old freshman left wing who also checks in at two hundred pounds, has performed well all things considered. Liam Folkes (37 ga, 12 go, 22 pts), the 22-year-old sophomore who also comes from north of the border, has doubled both his goals as well as points totals from last term. Nikita Pavlychev (34 ga, 9 go, 14 pts) has been reported to be “likely to return” for the NCAA match against Denver University and this development could be critical to the Nittany Lions’ fortunes. The 20-year-old sophomore from Russia uses his towering six-foot, seven-inch frame to good use and can cover a lot of territory with his stick, as one might well imagine. Pavlychev, who has missed PSU’s last three games on the trot with an undisclosed injury, had a shorthanded goal in the Midwest Regional Final versus the Pioneers last spring. Not only does Pavlychev center the Penn State line that the head coach Gadowsky prefers to deploy against the opponent’s top line, on the power play he also provides a very effective screen for the opposing goaltender. Perhaps it should be noted that PSU’s checking line is quite capable of scoring goals, too. Aside from Pavlychev’s nine, senior captain James Robinson has lit the lamp a half dozen times while freshman Sam Sternschein (205 lbs) has found the back of the net on five occasions. Trevor Hamilton (37 ga, 6 go, 29 pts), the 23-year-old senior who started his collegiate career at Miami University of Ohio, leads a group of Penn State defensemen who collectively like to get involved in the attack. Hamilton, who was named both 1st team All-Big Ten as well as the conference’s Defensive Player of the Year, also happens to lead the entire country in blocked shots so he is anything but a one-trick pony. Kevin Kerr, the 22-year-old junior from Bensalem who missed half of this 2017/18 campaign on account of injury, is typically Hamilton’s partner at the back. Cole Hults (37 ga, 3 go, 20 pts), the 19-year-old freshman whom the Los Angeles Kings claimed in the fifth round of the 2017 NHL Draft this past summer, was a very late cut from the United States squad that ultimately earned a bronze medal at the 2018 IIHF World Junior Championship this winter. The Finnish import Erik Autio (29 ga, 2 go, 14 pts), the only other senior on the entire Nittany Lions team, usually partners Hult on the second unit. PSU’s third defense pairing consists of Kris Myllari (37 ga, 5 go, 14 pts) and James Gobetz (210 lbs), the bruising sophomore who also scored a goal against Denver University in the NCAA Midwest Regional Final twelve months ago. Aside from offensive inclinations, another characteristic of Penn State’s blue line corps is that they do not lack size. Autio (5’10” 182 lbs) is easily the smallest of PSU’s defensemen but the other five regulars are all at least six feet and one hundred and ninety pounds. Additionally, as a unit, the Nittany Lions are very good at blocking shots. Peyton Jones (34 ga, 2.98 avg, .906 svpct), the 22-year-old sophomore from Langhorne, is certainly not the best goaltender in the entire country but he does have a Big Ten title on his resume, a task which required back to back double overtime victories in both the conference tournament’s semifinal as well as the final, itself. As for Jones, himself, the young man is said to be unflappable and even keeled. It is hard to believe that Peyton has not thought about a little pay back somewhere along the line over the past twelve months, as have the rest of his teammates.